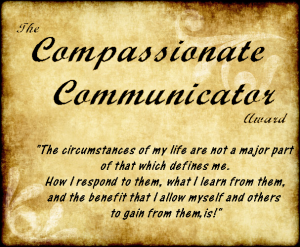 adlibb3d.wordpress.com just nominated me for the Compassionate Communicator Award, my first blog award everrr!! So of course I’m super excited and honored. 1~ I have a legit addiction to chocolate, which is why I must work at a candy shop to get my daily fix. 2~ I’ve been known to yell up to the sky and plead to the aliens to come down and abduct me. Multiple times. 4~My dreeeaamm for life is to have this book made into a movie directed by Tim Burton. Johnny Depp will play Ambrosius and Bella Heathcote will play Emma. The audiobook version must be read by Patrick Stewart. 5~I fully intend to own a llama at some point in my life. 6~I’ve lived in Wales for a year and can’t wait to go back. 7~ I have an insatiable fear of oopmah loompahs. Just keep them away from me. 3. Share seven things about yourself with your readers. Congrats on being a new blogger and getting this award. Pretty soon, you’ll feel like you’ve always been doing this! Thank you! And that’s an awesome idea- good thing I posted this on a Thursday 🙂 I think I’ll shoot to post something happy every week now too!